There are many great benefits from serving on the Board of the Arizona Chapter of the National Speakers Association. 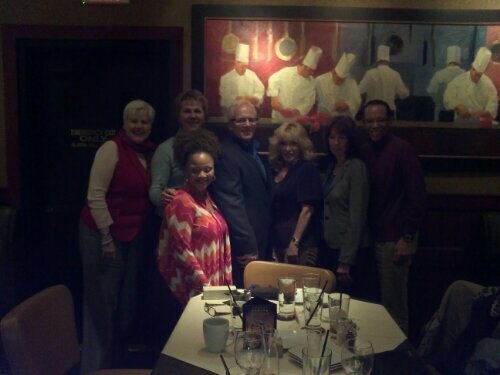 One of the most valuable is our Board Dinner meetings with our presenters the evening before. Here we are with Ford Saeks. If you are in Arizona and you are interested in internet marketing and leveraging your speaking career, this is not to be missed. Registration is available at NSA-Arizona.org. As a Team Alignment Expert, I feel confident in establishing my own definitions. Of course, because I am so opinionated, I do this all the time, not just in areas of expertise! High Performing Teams consistently share 3 characteristics…. 3) An ability to speak with one voice! Yesterday while having a Halpin Company Alumni Association lunch with a fabulous senior executive in one of Arizona’s biggest and most successful companies, we were celebrating her Quantum Leap Results. She reminded me that in order to build these kinds of teams, she had to do 3 things…. 2) Stay in the Conversation…. 3) Be Proactive, not Reactive. In order to do this, we both agreed we have to use lots of self-management approaches. It is always great to celebrate successes but especially with former clients who you worked with in 2005-2008! What successes have you had recently in forming high performing teams? This is something I intend to reflect on daily in 2013. Dear Abbey (Pauline Phillips) adapted this from the original Al-Anon Credo. It speaks for itself…. Just for today I will make a conscious effort to be agreeable. I will be kind and courteous to those who cross my path, and I will not speak ill of others. I will improve my appearance, speak softly, and not interrupt when someone else is talking. Just for today I will refrain from improving anybody but myself.